Map of results for each State and the Federal District. General elections were held in Brazil on 7 October 2018 to elect the President, Vice President and the National Congress. Elections for state governors and vice governors, state legislative assemblies and the Legislative Chamber of the Federal District were held at the same time. 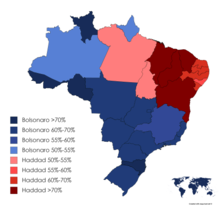 On 7 October 2018, Rio de Janeiro congressman Jair Bolsonaro came first in the first round of the presidential election. A run-off between him and former São Paulomayor Fernando Haddad was held on 28 October 2018. At 22:06 GMT, with 88% reporting, Bolsonaro was declared the winner with over 50% of the popular vote. The 2014 elections saw Workers’ Party candidate Dilma Rousseff reelected as President in the second round with 51.6% of the vote, defeating Aécio Neves of the Brazilian Social Democracy Party who received 48.4% of the vote. Rousseff had first been elected in the 2010 elections, succeeding her political mentor, Luiz Inácio Lula da Silva, who was in office from 2003 until 2011. However, on 3 December 2015, impeachment proceedings against Rousseff were officially accepted by the Chamber of Deputies. On 12 May 2016, the Federal Senate temporarily suspended Rousseff’s powers and duties for up to six months or until the Senate reached a verdict: to remove her from office if found guilty or to acquit her from the crimes charged. Vice President Michel Temer, of the Brazilian Democratic Movement Party, assumed her powers and duties as Acting President of Brazil during the suspension. On 31 August 2016, the Senate voted 61–20 in favor of impeachment, finding Rousseff guilty of breaking budgetary laws and removing her from office. Critics of the impeachment saw it as a legislative coup d’état. Vice President Temer succeeded Rousseff as the 37th President of Brazil. His government implemented policies that contradicted the platform on which Rousseff’s Workers Party had been elected, in one of the most controversial and politically-heated periods of modern Brazilian history. Voting in Brazil is allowed for citizens over 16 years of age, and mandatory for those between 18 and 70 years of age. [dubious – discuss] Those who do not vote in an election and do not later present an acceptable justification (such as being away from their voting location at the time) must pay a fine of 3.51 BRL (equivalent to 0.90 USD as of October 2018). Brazilian citizens residing abroad only vote for president. The President and the Vice President of Brazil are elected using the two-round system. Citizens may field their candidacies for the presidency, and participate in the general elections, which are held on the first Sunday in October (in this instance, 7 October 2018). If the most-voted candidate takes more than 50% of the overall vote, he or she is declared elected. If the 50% threshold is not met by any candidate, a second round of voting is held on the last Sunday in October (in this instance, 28 October 2018). In the second round, only the two most-voted candidates from the first round may participate. The winner of the second round is elected President of Brazil. Candidates for President run for office jointly with a candidate for Vice-President, and the Vice-President is elected as a consequence of the election of the President. The Governors and Vice Governors of all states and of the Federal District were elected, in two rounds when needed, in the same way as the presidential election. Two-thirds of the 81 members of the Federal Senate will be elected for a term of 8 years in office, the other third having been elected in 2014. Two candidates will be elected from each of the states and Federal District using majority block voting, with voters able to cast two votes each. All 513 members of the Chamber of Deputies (federal deputies) will be elected, with candidates elected from 27 multi-member constituencies corresponding to the states and Federal District, varying in size from eight to 70 seats. The Chamber elections are held using open list proportional representation, with seats allocated using the simple quotient. All members of the State Legislative Assemblies (state deputies) and of the Federal District Legislative Chamber (district deputies), varying in size from 24 to 94 seats, will be elected. These elections are also held using open list proportional representation, with seats allocated using the simple quotient. On 1 September, the Superior Electoral Court voted 6–1 to reject Lula’s candidacy, but approved the PT-PCdoB-PROS coalition “The People Happy Again” and the vice-presidential candidacy of Fernando Haddad. The Workers’ Party replaced Lula with Haddad and announced the former presidential candidate Manuela D’Ávila as his running mate. Jair Bolsonaro was stabbed on 6 September 2018 while campaigning in the city of Juiz de Fora, Minas Gerais and interacting with supporters. Bolsonaro’s son, Flávio, has stated that his father’s wounds were only superficial and he was recovering in hospital. Police arrested and identified the attacker as Adelio Bispo de Oliveira, who claimed that he was “ordered by God to carry out the attack”.Flávio Bolsonaro later stated that the wounds inflicted seem worse than initially thought. He tweeted about his father’s condition, explaining that the perforation reached part of the liver, the lung and part of the intestine. He also stated that Bolsonaro had lost a large amount of blood, arriving at the hospital with a pressure of 10/3, but had since stabilized. Most of the other candidates in the presidential race (from both sides of the political spectrum), and the current Brazilian president, Michel Temer, condemned the attack. After being stabbed, Bolsonaro did not attend any further debates. Two debates were held on 9 August and 17 August, featuring eight presidential candidates: Bolsonaro, Alckmin, Silva, Gomes, Dias, Meirelles, Boulos, and Daciolo. Lula was unable to participate in the debates. The 9 August debate was moderated by Ricardo Boechat, and the 17 August debate was moderated by Amanda Klein, Boris Casoy and Mariana Godoy. A debate scheduled for 27 August was canceled after Jair Bolsonaro expressed his uncertainty about participating in the debates and the Workers’ Party insisted on the participation of Lula, prohibited by the Electoral Justice. Bolsonaro did not participate in further debates after he was attacked on 6 September. After a debate on 9 September moderated by Maria Lydia Flândoli, Fernando Haddad participated in all remaining debates. These occurred on 20 September (moderated by Joyce Ribeiro), 26 September (moderated by Carlos Nascimento), 30 September (moderated by Adriana Araújo and Celso Freitas), and 4 October (moderated by William Bonner). A vice presidential debate was held on 5 September featuring four candidates; Fernando Haddad did not attend. While several debates were scheduled for the second round, none were held. Debates planned for 12 October, 14 October, and 15 October were cancelled due to Bolsonaro’s health issues. A debate scheduled for 21 October was cancelled after the campaigns were unable to agree to terms. US President Donald Trump congratulated Bolsonaro on his election victory, Trump and Bolsonaro both agreed to work side-by-side to improve the lives of the people of the United States and Brazil, and as regional leaders, of the Americas. French President Emmanuel Macron congratulated Bolsonaro on his election victory, added that France would look to continue to cooperate with Brazil on areas including environmental issues. “France and Brazil have a strategic partnership based around common values of respect and the promotion of democratic principles,” added Macron in his statement.